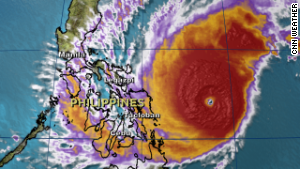 Legazpi, Philippines (CNN) -- The deadly storm that battered the Philippines for days weakened Monday as it rumbled from one island to another, passing close to the densely populated capital city of Manila. Officials revised the death toll downward to 25 from 27 on Wednesday after two people were found alive, Philippine Red Cross Chairman Richard Gordon told CNN. Tropical Storm Hagupit, which was downgraded from typhoon strength Monday, slammed into the eastern Philippines late Saturday. It brought fierce winds and torrential rain to roughly the same region ravaged by Super Typhoon Haiyan in November last year. But while Haiyan left more than 7,000 people dead or missing, Hagupit's toll so far remains in the double digits. Hagupit has had a powerful impact across several major Philippine islands, driving hundreds of thousands of people from their houses, tearing down trees and causing floods. 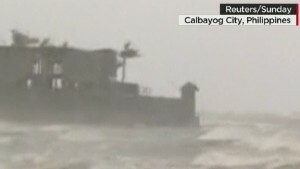 It has destroyed nearly 1,000 homes, Gwendolyn Pang, the secretary general of the Philippine Red Cross, told CNN. "I am worried -- I am thinking of my children and my grandchildren. They are so young, that's why we're here," said Pilar Rangosajo, a grandmother taking refuge in an evacuation center in the city of Legazpi. "It's so hard for me because every typhoon damages our home. We don't have the money to fix it." Her concerns are common in a country where many people live in lightly built wooden houses. As Hagupit -- known locally as Ruby -- continued to howl over the archipelago, officials have begun to assess the scale of the damage in the regions it hit. Emergency response teams are trying to reach some of the remote areas where little is known about the storm's effects. But officials praised the success of efforts to relocate large numbers of people away from vulnerable coastal areas, citing fears of a repeat of last year's devastation as a motivating factor. "People didn't have to be pushed anymore," Gordon said. "They knew that they could face another Haiyan, and Haiyan killed a lot of people from storm surges." In Tacloban, the city hardest hit by Haiyan, around half the 200,000 residents evacuated to safer areas ahead of Hagupit, the U.N. humanitarian agency OCHA Philippines said. Hagupit has been less powerful than Haiyan, but it is moving at a much slower pace. Weather forecasters said that means Hagupit will dump large amounts of heavy rain on areas in its path, increasing the risk of landslides and flash floods. "It doesn't matter right now if it's a typhoon or tropical storm -- this is a rainmaker," meteorologist Tom Sater said. Noel Rosal, the mayor of Legazpi, said that "for almost 20 hours, we were battered by rain and strong winds." Flooding concerns are particularly acute for Manila, the national capital whose metropolitan region is home to nearly 12 million people. Because of the area's geography, many parts of Manila are susceptible to flash floods. Hagupit passed to the south of Manila late Monday and early Tuesday, over the province of Batangas. Humanitarian workers were also facing challenges coping with the sheer number of people relying on evacuation centers for support. "Health issues are kind of difficult when you have 900,000 people crammed into rescue centers," Gordon said, raising concerns about sanitation and respiratory illnesses in particular. Saima Mohsin reported from Legazpi, and Jethro Mullen reported and wrote from Hong Kong. CNN's Mitra Mobasherat, Yoko Wakatsuki, Pedram Javaheri and Andrew Stevens contributed to this report.